This week at #SundaySupper we focus on EASY to make, Red, White and Blue dishes that you can make at the last minute. 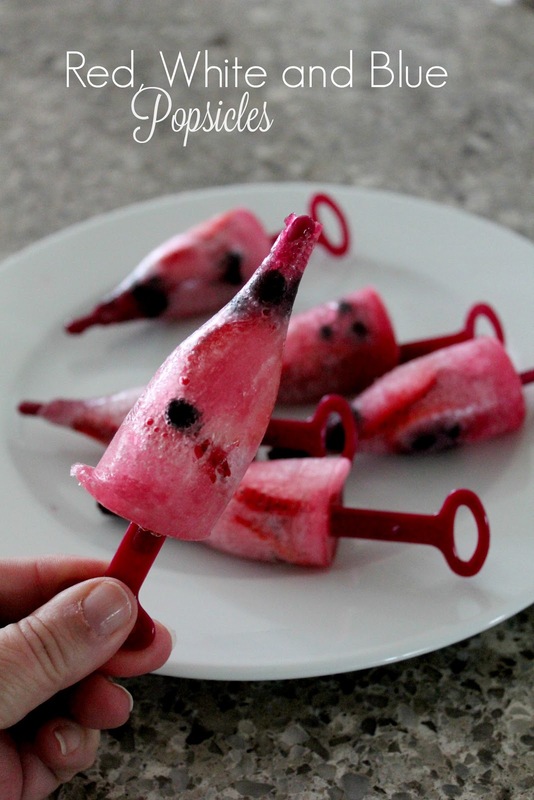 You can make these popsicles ahead of time and have them ready to go when you need a cold treat. These are super easy to make! My mold is in the shape of a small champagne bottle, so I thought using a little bubbly (in the form of Sprite!) was appropriate! You could use coconut water, lemonade, or other white or clear liquids. I like how the bubbles make tiny spaces in the popsicle! If you like this mold, it is called Betchsicles. I got it with my subscription box this month. Wash strawberries and slice them up. Wash blueberries and wipe dry. 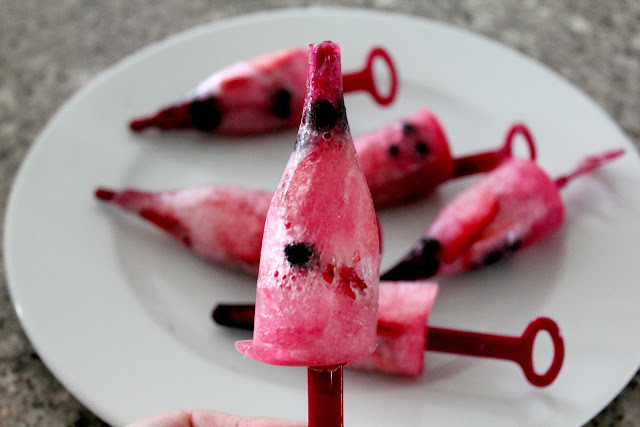 Place blueberries in the bottom (it will be the top of the popsicle) and arrange strawberries in each mold. Pour Sprite S L O W L Y into the mold. This will keep the fruit in place. Freeze. To remove popsicles, run warm water over the bottom of the mold, gently remove popsicle. Here are more wonderful recipes from our friends at #SundaySupper. Visit these bloggers and you will not be disappointed! So cute Terri! A great cool down treat! What fun, celebratory pops! Perfect for the 4th! Cute molds! They would cool me off on a hot day! These are awesome. I love how festive they are. Those popsicles are really fun and festive! I love the assortment of recipes you offered - the sugar cookies look like something I would like to try! Cookies are my weakness! These look adorable, and with how easy they are to make, I think even I can do it! Perfect when I need something quick. Cute popsicles! Love them! Enjoy your 4th!! These are sure cute! I love that they're in the shape of champagne bottles. I never thought to add bubbly soda to popsicles. Great idea! Popsicles are the easiest to make during the summer and they are one of the yummiest treats too. I love homemade popsicles because you can create your own recipe and add things that you love, like fresh fruits! This is recipe is a keeper and you can have it even after the 4th of July! Interesting idea using sprite to make popsicles. I love the pretty color of this refreshing treat. Ah yes I remember seeing your other post with the champagne molds, this is one of the coolest things I have ever seen. Perfect for parties. I love the shape of these ice pops! We love making our own! Sprite and berries, they make wonderful taste. I'm looking for some idea for bbq party, I think this is a perfect dessert to serve. Pinned it. These popsicles are so festive and patriotic. They would have been perfect for serving to the family this past July 4th. Omg not only do these look delicious they sound yummy as well!!!!! So patriotic! So making these! These look delicious! And I love the champagne bottle mold. So fun! I'll have to pin this for later. This is such a refreshing popsicle recipe! I am looking for lots of them too, as my kids want them constantly. Great collection of recipes here - I am definitely digging that founders mac and cheese. OK that mold is so so cute! It took me a minute to figure out what it was but I LOVE it! Also such a great idea to add a little bubbly, have never done that before, so fun and festive! I didn't know you could freeze Sprite! what cute molds. I never seen champagne molds like this love this idea for pops beyond the 4th of july!